So What Can You Use Glowsticks For? Home » So What Can You Use Glowsticks For? 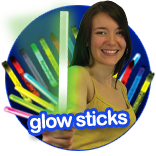 Glowsticks are pretty famous for their use in the party scene but this versatile little product’s uses are endless. Originally developed by the military in the 60’s a patent was issued in January 1976 for a Chemical Luminescent Signal Device and credited to inventors Vincent J Esposito, Steven M Little and John H Lyons; this bears the closest resemblance to today’s design. This design was adopted by the military as chemilights (as the military refer to them) glow from an internal source that requires no gas, electricity or ignition spark, it is simply a light source created as a result of a chemical reaction. This makes them perfect for emergency situations, or volatile situations that may involve gas, explosions or fire, after all, you need a light source, not something that’s going to make the situation worse! Glow sticks are in fact that only light source recommended for use after natural disasters because of their safe contained light that requires no electricity and more importantly creates no sparks. The military were onto a good thing, and so as with any such product, civilians soon got their hands on them. Glow sticks, or light sticks as they have also become known have been adopted into the recreational world and are incredibly popular with divers as they’re waterproof and can withstand high pressure whilst providing light for them to see and to be seen. It’s down to these very reasons that glowsticks are also popular in sports such as caving or potholing; they’re even used as fishing lures for big bait fish such as swordfish! The recent emergence of night sports such as night golf has also been down to the humble glowstick. Golfers light up their clubs, the fairway and putting hole using glowsticks and then themselves with glow necklaces and so that they can easily be seen in the dark, and can form teams using particular colours. A glow in the dark golf ball is then used, and there you have it, the solution to the keen golfer’s problem of early dark nights! Sports of course haven’t been the only recreational use for glow sticks, they’re well championed in the performance arts and glowsticking is an art form in its own right that was developed by poists and juggling performers and was quickly adopted into the music scene with performances regularly seen at festivals and in big clubs. This incredible visual performance led to a huge demand for glowsticks as regular clubbers wanted to emulate the performances seen in the clubs if only with one or two light sticks being held in the hand; a less elaborate display, but pretty funky none the less. 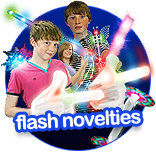 Anything adults can do, kids can do better and glowsticks in their many guises have become incredibly popular at children’s event and parties, kids love the excitement and the vibrant colourful glow of glow sticks that really add to their party atmosphere. It’s this popularity amongst kids and adults alike that make glowsticks, glow necklaces, glow bracelets and glow novelties ideal for fundraising activities as they’re relatively cheap to buy in quantity with a large return on investment leaving a large margin for the required cause. With children in mind, glowsticks, or snap lights as they’re sometimes known are fantastic high visibility tools. 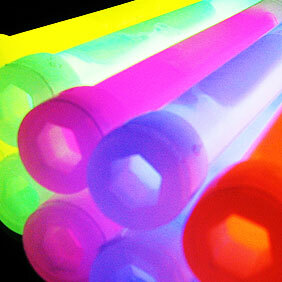 Glow necklaces, glow bracelets and glowsticks are becoming increasingly popular for celebrations such as Halloween. It’s easy to incorporate a glowstick into your child’s costume so that they’re easily seen by traffic and are easy for parents to spot when keeping an eye on their kids in a crowd. They’re also a fabulous and safe alternative to candles to make those pumpkins glow! Still struggling for uses? Well, speaking of safe alternatives to candles, glow sticks are being increasingly used by schools in carol services, Christingle services and choir performances where candles may have traditionally been used to create a festive effect. 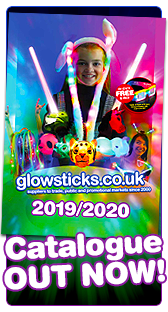 Glowsticks are the obvious answer as there is no flame and they remain cool to the touch despite a strong bright glow which means that even the smallest children can be involved in the events, there’s no fire hazard, and the kids have a souvenir of their performance! Such a versatile product, the list of uses for glowsticks is endless, they’re even being incorporated into a new art movement; light art. Artists create incredible effects using LED’s glowsticks and photography for the most stunning effects, with such wide appeal that the movement is enjoying a huge surge in popularity. Is it all down to that wonderful vibrant glow? It seems that the wide allure of glowsticks is going to continue to grow, and it’s all down to their simple formula, they’re cheap, disposable, waterproof, can withstand high pressure, they’re safe, colourful, vibrant and most all, they’re brilliant fun!